Imagine my horror when I read that at the same time I was looking at reports of a whopping 3.397 billion people being on social media this article tells me it's only 2.46 billion (not sure where that number came from). Never mind that's just a minor distraction from the core message. If your business hasn’t already, it should start targeting leads on social media. Some social media mediums are more effective for sales prospecting than others. LinkedIn and Twitter are your best bet to target if you want to either hunt for leads or have them contact you. Ollie hits the nail on the head reminding us that social media and social selling allows prospects to contact us. Inbound is such a valuable commodity. Strategy 7 covers 'referrals' is a good one although I'm not sure about referral websites. You want your happy customers to directly refer you to their contacts, introduce you to their network and allow you to use them as a reference client. I spend my time evangelizing about social media and social selling - this doesn't mean I'm a closed book. I have a good grasp on past strategies, what works today and what we need to be good at to survive and thrive. Hence my comments relating to the article. 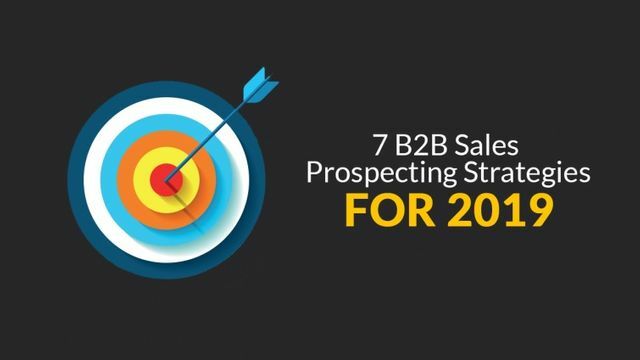 Cold calling, email prospecting, mail, event prospecting and joining niche groups are strategies that are not only a waste of your time and money but also those of your target prospects. If you really drill down into the effectiveness of these 'strategies' you will see how ineffective they are. You will see that cold calling involves trying to trick people into taking your calls. No one likes taking a cold call. When you're sat at home, do you want your phone ringing all night, cold emails filling your inbox or your doormat being covered in mail? No. If you want to buy anything (we all like to buy and not be sold to) then you will reach out online, most probably using social media as your sounding board. Yes, there will be exceptions - which is why Usain Bolt ran the 100m in 9.58 seconds but no one else has. Exceptions are just that, one-offs. I had a call today with a group of talented sales professionals - I told them 'social selling is THE number one prospecting tool'. Maybe I need to tweak that so I don't mislead anyone - 'Social Selling is THE prospecting tool'. In summary - don't waste time trying to prove out of date, budget sapping and ineffective strategies still work - they don't. The only way to make cold calling more effective is to stop flogging a dead horse. Strategy 1: Cold Calling Cold calling is still one of the most effective methods for sales prospecting. It may not be one that agents enjoy, however, it is effective. There is a way to go about cold calling to make it more effective.